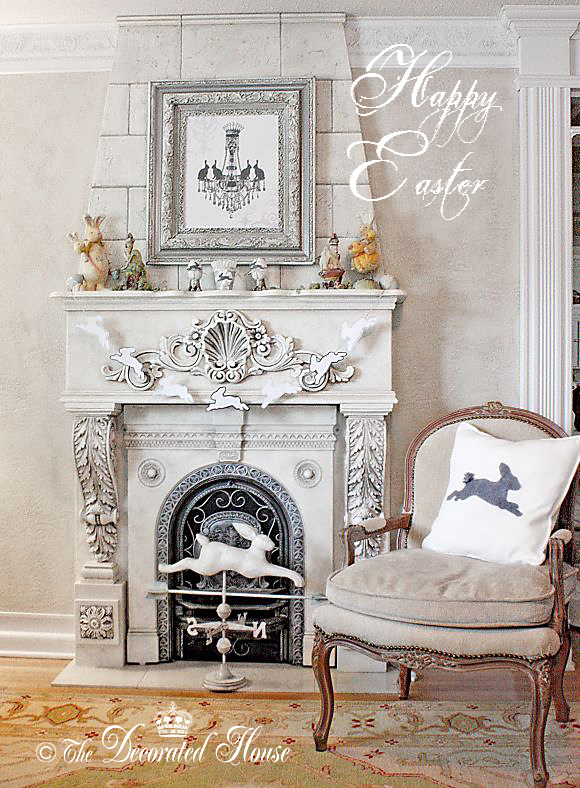 The Decorated House: ~ Happy Easter to You! Please share where you got the adorable chandelier print! Love it. Hello, I'm happy you stopped by and left your sweet comment. (This comment is off topic). Saw your previous black glaze cabinet tutorial and loved it! I was wondering what paint or glaze color /brand / method you used to make the new added trim match the older wood from the cabinets? Hi~ The cabinets that you see in the picture are all completely newly painted, there is none of the old wood showing. As a matter of fact, I had painted them all white previous to the "faux bois" finish. I use any good quality paint for my base coats and usually an artist glaze medium to mix my glazes. (Look for bottles where they sell art paints in tubes.) If you are just adding wood trim, and trying to match the wood you have, mix small amounts of art or craft paints with glaze until you get a color that works. Then you can have that color matched at a paint store, or Lowes - Home Depot, Ace etc.